Guy Gimson, co-chair of next year's competition with his wife, Judy, takes a swing during the early matches on Friday. 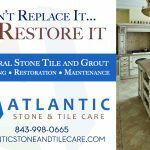 Although it may have been a bit on the warm side for October, the weather was sunny and gorgeous for the 26th Alan Fleming Senior Open Clay Court State Championship held this past October 7 – 11 at the Seabrook Island Racquet Club. 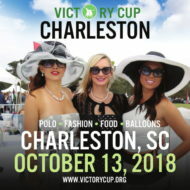 This annual event is a South Carolina Level 1 State Championship event as well as a Southern 200 point tournament with 42 events including singles, doubles, and mixed doubles. Age categories for both men and women range from 40 years old to over 80. 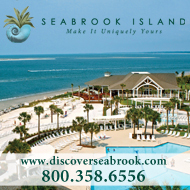 This year featured a record 228 players, 63 of which were Seabrook Island residents. There were 98 singles entries and 279 doubles entries, and a total of 13 states were represented, as well as Puerto Rico and Toronto, Canada. 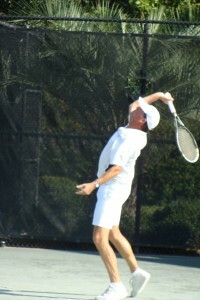 This year’s stand out players included Bill Weathers, who has won over 300 Southern tournaments, is a member of the Southern Tennis Hall of Fame and Player of the Year in 2002, and winner of the distinguished Competitor Award at the Alan Fleming Tournament in 2004; Yataka Kobiashi, winner of three bronze balls at the Men’s 85’s singles and doubles national championships after 25 years of competition; Diane Fishburne, winner of three World Singles titles and more than 25 national titles; and Brenda Carter, who won the 2007 ITF World Championships held in New Zealand and has won 25 gold balls in both singles and doubles over eight years of national competition. “From the beginning of the event in the early 1980’s the tournament has consistently drawn top ranked national players and as well as world champions competing here on Seabrook Island,” said Kaiser. Special thanks go to tournament chairs Margerette Fletcher and Pat Marino, as well as referees Mary Anna Scott and Pat Staley and this year’s committee heads, including Margarette Fletcher, Pat Marino, Lauren Sutton, M.J. Zuccaro, Judy Gimson, Guy Gimson , Greg Gilleard, Emily Goodwin, Rita Tyler, Barbara Condon, Bob Hider, Helen Bosshart, Joe Gallagher, Lew Johnson, Chuck Bensonhaver, Lauren Sutton, M.J. Zuccaro, Margo Heyd, Hutchie Cummins, Diana Cohen and Mike Kiser. More $36,000 was raised over the course of the competition and will be donated to the Hospice of Charleston. This is the eighth year that the Hospice will be the recipient charity for the Tournament.